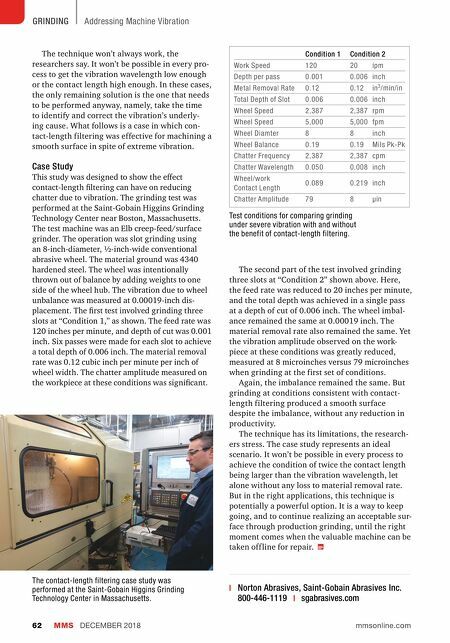 MMS DECEMBER 2018 62 mmsonline.com GRINDING Addressing Machine Vibration The technique won't always work, the researchers say. It won't be possible in every pro- cess to get the vibration wavelength low enough or the contact length high enough. In these cases, the only remaining solution is the one that needs to be performed anyway, namely, take the time to identify and correct the vibration's underly- ing cause. What follows is a case in which con- tact-length filtering was effective for machining a smooth surface in spite of extreme vibration. Case Study This study was designed to show the effect contact-length filtering can have on reducing chatter due to vibration. The grinding test was performed at the Saint-Gobain Higgins Grinding Technology Center near Boston, Massachusetts. The test machine was an Elb creep-feed/surface grinder. The operation was slot grinding using an 8-inch-diameter, ½-inch-wide conventional abrasive wheel. The material ground was 4340 hardened steel. The wheel was intentionally thrown out of balance by adding weights to one side of the wheel hub. The vibration due to wheel unbalance was measured at 0.00019-inch dis- placement. The first test involved grinding three slots at "Condition 1," as shown. The feed rate was 120 inches per minute, and depth of cut was 0.001 inch. Six passes were made for each slot to achieve a total depth of 0.006 inch. The material removal rate was 0.12 cubic inch per minute per inch of wheel width. The chatter amplitude measured on the workpiece at these conditions was significant. | Norton Abrasives, Saint-Gobain Abrasives Inc. 800-446-1119 | sgabrasives.com The second part of the test involved grinding three slots at "Condition 2" shown above. Here, the feed rate was reduced to 20 inches per minute, and the total depth was achieved in a single pass at a depth of cut of 0.006 inch. The wheel imbal- ance remained the same at 0.00019 inch. The material removal rate also remained the same. Yet the vibration amplitude observed on the work- piece at these conditions was greatly reduced, measured at 8 microinches versus 79 microinches when grinding at the first set of conditions. Again, the imbalance remained the same. But grinding at conditions consistent with contact- length filtering produced a smooth surface despite the imbalance, without any reduction in productivity. The technique has its limitations, the research- ers stress. The case study represents an ideal scenario. It won't be possible in every process to achieve the condition of twice the contact length being larger than the vibration wavelength, let alone without any loss to material removal rate. But in the right applications, this technique is potentially a powerful option. 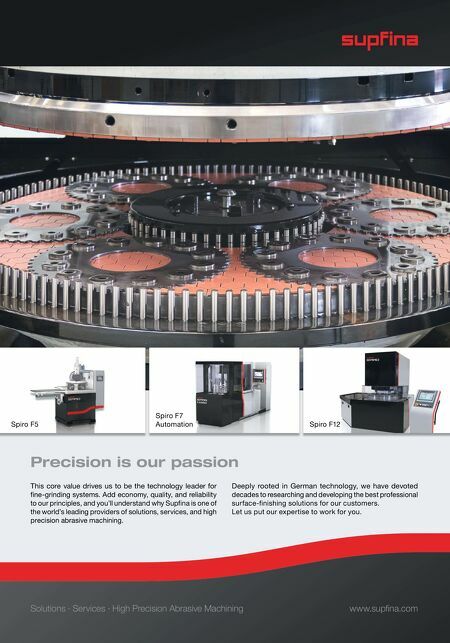 It is a way to keep going, and to continue realizing an acceptable sur- face through production grinding, until the right moment comes when the valuable machine can be taken off line for repair. Condition 1 Condition 2 Work Speed 120 20 ipm Depth per pass 0.001 0.006 inch Metal Removal Rate 0.12 0.12 in 3 /min/in Total Depth of Slot 0.006 0.006 inch Wheel Speed 2,387 2,387 rpm Wheel Speed 5,000 5,000 fpm Wheel Diamter 8 8 inch Wheel Balance 0.19 0.19 Mils Pk-Pk Chatter Frequency 2,387 2,387 cpm Chatter Wavelength 0.050 0.008 inch Wheel/work Contact Length 0.089 0.219 inch Chatter Amplitude 79 8 μin The contact-length filtering case study was performed at the Saint-Gobain Higgins Grinding Technology Center in Massachusetts. Test conditions for comparing grinding under severe vibration with and without the benefit of contact-length filtering.